Writing in the journal Energy Policy, Benjamin Sovacool of the National University of Singapore and Richard F. Hirsh of Virginia Polytechnic Institute note that the vehicle-to-grid concept – in which automobiles would be continually hooked up to the larger power grid, both taking energy from it and supplying energy to it – would be a major advance on many levels. Such a plan could potentially cut our nation’s need for imported oil in half, improve pollution levels and cut greenhouse gas emissions. 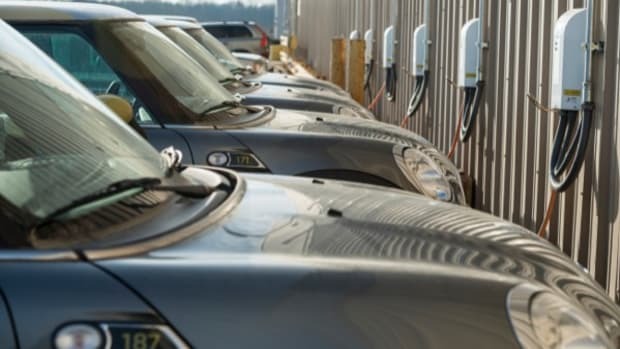 But they argue that if we’re going to spend the “huge amounts of money” needed to develop such a system – with plug-in vehicles being the precursor – we’d better take into account the inevitable resistance that will arise to such a radical change. Auto manufacturers won’t have that specific problem – a car will still look like a car – but it will feel different to drive. A survey of drivers of prototype plug-in vehicles found many complaints about their lack of performance, including their inability to reach speeds as high as those common with combustion engines. The high some drivers obtain from putting the pedal to the metal (perhaps putting "the plug to the rug"?) will have to be found elsewhere. Such vehicles would be far more economical to run than today’s automobiles, especially if owners can sell back energy they have generated, but not used, to the power company. But up-front costs will be high, and the authors note that few buyers are sophisticated enough to correctly calculate how much they will save over the years. Then, of course, there will be opposition from industry – and not just the oil companies. “The cost of EV maintenance should be minimal, since the vehicles have fewer moving parts and need no lubricating oils, filters, coolants, clutches, spark plugs,” etc., the report notes. More than 800,000 people are employed as automobile service technicians. Their jobs – their industry – will disappear, presumably not without a fight. “In short, many of the most significant participants in the existing transportation infrastructure have huge stakes in maintaining the status quo,” the authors conclude. While they don’t make specific recommendations as to how to address these issues, the scholars rightly insist that policymakers need to be thinking about them now, at the same time scientists are working to develop the technology that will make electric vehicles the norm. If we ignore the human side of the issue, they warn, all that brilliant scientific work could end up as useless as a dead car battery.